Dr. Han began his teaching ministry at Han Young Theological University in 1989 where he later served as the Dean of the Graduate Schools. Transitioning to the States in 2002, Dr. Han began teaching at the Pentecostal Theological Seminary as a full-time faculty in theology. Dr. Han's doctoral work, A Revisionist Spirit-Christology in Korean Culture, takes on a sanctificationist approach to the issues of salvation, couched in the contextual particularities of Korean Culture. Dr. Han has published articles and chapters in various journals and books on theological issues such as sin and salvation, Jesus and the Spirit, the Spirit and life, Pentecostalism in Asia, Christian hospitality and pastoral practices. Dr. Han’s contribution in theological education is in part interlaced with the denominational appointments, e.g. the General Education Board for the Church of God, the Committee Chair for the the International Pentecostal Symposium, the Administrative Bishop for the Church of God in Korea and the member of the International Council for Asia and the Pacific. Dr. Han has been involved in significant ecumenical dialogues as well, e.g. Church of God & Mennonites in U.S.A. Dialogue, Christian Churches Together in the U.S.A., Global Christian Forum. 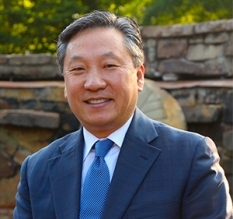 Dr. Han currently serves on the central steering committee for the Global Christian Forum Committee. Dr. Han has also been invited to participate in dialogues such as "Race and Ethnicity in American Pentecostalism" and "Christian Hospitality and Pastoral Practices in a Multi-faith Context. Dr. Han was previously selected for the Pre-Tenure Faculty Workshop program and consequently received a faculty research/writing grant from the Wabash Center Summer Fellowship Program (2009). Recently, Dr. Han has been honored by two successive grants from the Association of Theological Schools, i.e. the 2011-2012 Lilly Theological Scholars Grant and a project titled, "Christian Hospitality and Neighborliness in a Multi-Faith Context: A Wesleyan-Pentecostal Paradigm.” Dr. Han's forthcoming monograph (Christian Hospitality and Neighborliness in Wesleyan-Pentecostal Tradition) will be an edited volume on the papers presented at the 2012 Ministers' Week conference on Christian Hospitality and Neighborliness in a Multi-Faith Context.